This tasty Greek Salad combines tomatoes, green peppers and cucumbers in a tangy lemon and olive oil dressing. It combines Goat cheese and Kalamata olives for a nice change and makes a great side dish. Mediterranean inspired recipes make use of real natural flavors that are heart healthy and just full of flavor. This salad comes together quickly and tastes amazing. This easy to make salad pairs well with grilled lamb chops, basic quiche or many other meat dishes. What do you think of Greek Salads? Do you find the flavors different from other Mediterranean styled salads? Do you think it is the olives that give the dish its extra special touch? For more recipes, be sure to visit my Facebook Gardening Cook page. This tasty Greek Salad combines tomatoes, green peppers and cucumbers in a tangy lemon and olive oil dressing. It has Goat cheese and Kalamata olives for a nice change and makes a great side dish. Cut up tomatoes and place in medium-sized bowl. Add half the mint, half the thyme, the salt, and a bit of fresh-ground black pepper. Combine ingredients and let sit at room temperature for about one hour. In a separate bowl, combine goat cheese, remaining mint, remaining thyme, and a bit more fresh-ground pepper. Let sit at room temperature about one hour. Cut up cucumbers and green peppers into bite-sized pieces. Slice the green onions and add to the cucumbers and green peppers. 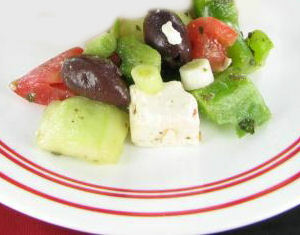 Add in the combined tomato mixture, Goat cheese, mixture, cucumbers, green onions, Green peppers and olives in large bowl. Let sit at room temperature for a few minutes. Just before serving, the olive oil and fresh lemon juice and mix gently with salad ingredients. (You may not need all the dressing depending on how wet you prefer your salad.) Season with salt and more fresh ground black pepper if desired and serve.